Research: How Long Should Your Content Be — Smile Bright Media inc.
We decided to thoroughly study preferences among readers of well-known media outlets that cover Tech and Startups topics. Collected data should help companies dealing with content marketing in planning their business activity. Tech in Asia — an IT-related project focused on the Asian regions. We analyzed 100 articles per resource - these were not just news updates, but editorials or dedicated entries of independent representatives of different companies. Famous publications have almost stopped the practice of using open view counters. This is why the popularity of the material was determined via data of social media likes and “shares” (here included Facebook, Twitter, LinkedIn and Google+). The number of resources represented by “social” buttons of specific resources can differ, but the four above mentioned services always remain. Important footnote: some research shows that it is common thing to share articles within social networks without actually reading them. Most well-known entry upon this topic - a text by Slate published back in 2013. 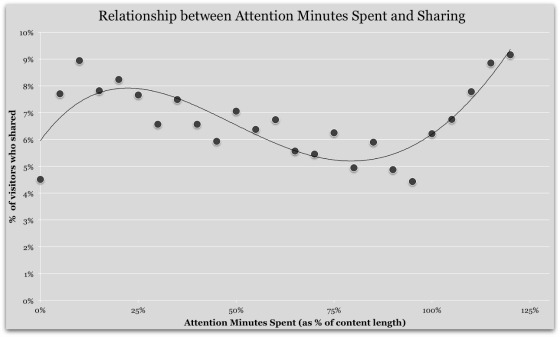 Media analytics resource Upworthy also has data proving that users who have read 25% of the word count, are more likely to “share” the piece, than those who did not read the text. Or, those who stayed on the web page for a longer period of time, and then that indicator goes up again. Therefore, social network “shares” cannot represent a universal way of measuring readers’ engagement, but they allow us to compose a particular opinion on the involvement of the audience regarding the content. Furthermore, given the the resources in question do not represent other instruments to measure popularity, we used what was at our disposal. We broke down our analysis into several lines - technology and startups topics, more specialized “analytical” materials and a topic connected to reading English-speaking materials by users from Asia. Readers’ preferences can vary within the topic of tech and startups. ZDnet.com has all the reputation of a serious outlet publishing only specialized material. This audience is formed not only by tech fans, but also by C-level IT managers. Last year we published research on what text length is most favored by readers in Eastern Europe. We analyzed most popular IT and Startups web resources in this region. It appeared that companies who post on these resources prefered to publish texts of between 5k and 10k long (spaces included). “Geeky” readers than fond of tech do not choose to read texts from that group: they enjoy texts of 10k to 15k symbols long. Articles of 10k to 15k words long are not just frequently read, but also appeared to be getting more comments. Audience of the business related media outlets tends to read medium-length with the most commented articles being those of 20k+ symbols. Also these people enjoy a good long read with 20k plus symbol texts and read these quite frequently. Therefore, it seem that Easter European readers’ preferences are close to interests of mass-media web visitors from Asia. Short articles are recognized by Russian users only when these are news entries. In all other cases, people are prone to know more on the subject. Readers do not like long reads on tech and startups — you should be brief enough not to loose reader's attention. Asian English readers prefer medium-length pieces to short ones. People from those regions do not pay much attention to long reads, however, super short pieces are not their choice either. While dealing with this audience it is better to prepare interesting and well composed pieces of medium length. There is no need to artificially make the text shorter. Our survey shows that almost every article which fits the mid-length category finds its reader, though such pieces may give way to short texts in terms of readership. One should not underestimate LinkedIn. Our social media analysis shows that this network is a great source of traffic as readers of different media tend to share there content they like.